While the tomatoes all languish in the house (outgrowing their pots by leaps and bounds) waiting for it to warm the heck up, the cold – weather crops are all coming in like crazy. The beans and peas are starting to climb the wire trellis and I hope soon we’ll see some actual pods. The lettuces (Black Seeded Simpson and Red Romaine) are all just about ready to be picked for salads, and the spinach is not far behind. The broccoli is getting nice and leafy and I am waiting impatiently to see the flowery part! Then there is the kale. It is screaming for attention and picking right now – growing head and shoulders above everything else. I wasn’t planning on making anything kale – related for dinner tonight, and it’s not very tall yet – but it is very crowded so I decided the time was about right to pick some of the tender leaves for making kale chips. Kale is one of those greens that is very at home in a potato or ham – based soup – it is very sturdy and flavorful without being too overpowering (it is actually a part of the cabbage family). It is also very good for you – being high in beta carotene, vitamin K, vitamin C and even calcium! 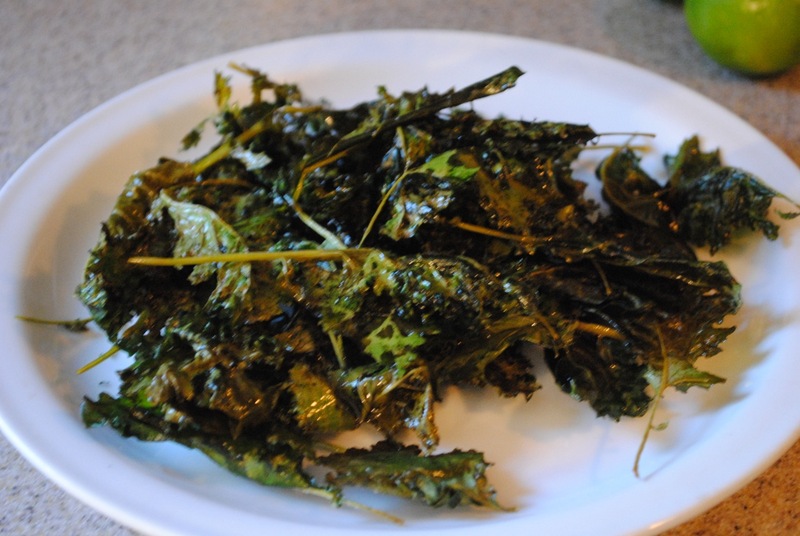 Kale chips can be made with large, fully – grown kale leaves, but I like to make them with the more tender, smaller leaves. 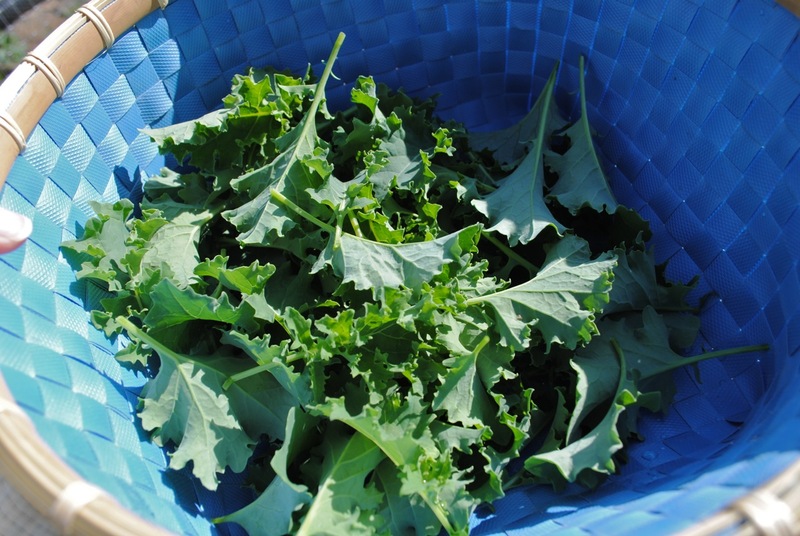 If you use big kale leaves, you’ll need to remove the stems and the ribs to make the chips. With the small, baby leaves it’s not really necessary. Preheat your oven to 300 degrees and wash your kale. I just give mine a quick rinse if I’ve just pulled it from the garden – really all I am worried about is that we don’t end up eating too many hidden little bugs or spiders! 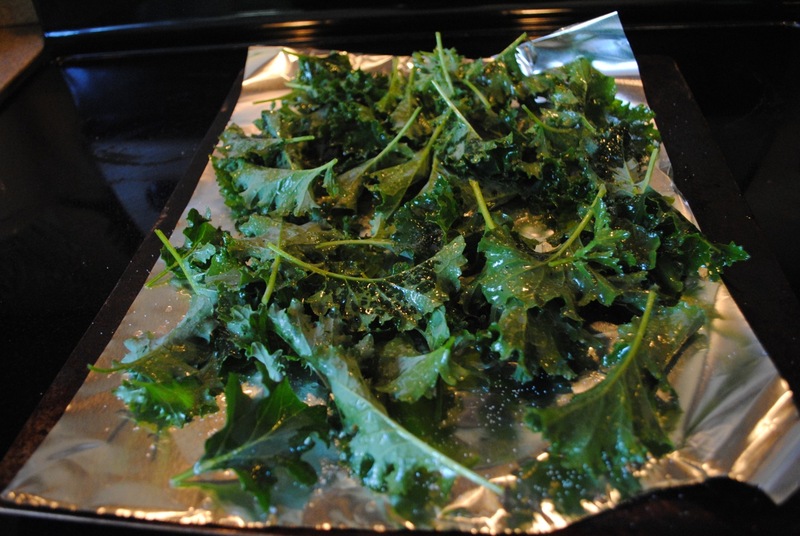 Lay your kale in a single layer on a cookie sheet either coated with cooking spray or with foil. Drizzle some olive oil and salt and pepper to taste. I also like to splash some vinegar on them – like salt & vinegar chips (malt vinegar is best, but just about any will work)! Bake for about 20 to 25 minutes or until they are nice and dark and crispy. They will come out like this – all nice and blurry! Oona and I hogged all of these up before anyone else even got wind they were done. They were yummy! LOVE KALE!!! Spring is so wonderful! I love kale! My favorite way to eat it is mixed up with a banana and frozen fruit in a smoothie, or in a salad with ripe avocado, toasted almonds, and onion. 🙂 Thanks for sharing!